We introduce heap automata, a formalism for automatic reasoning about robustness properties of the symbolic heap fragment of separation logic with user-defined inductive predicates. 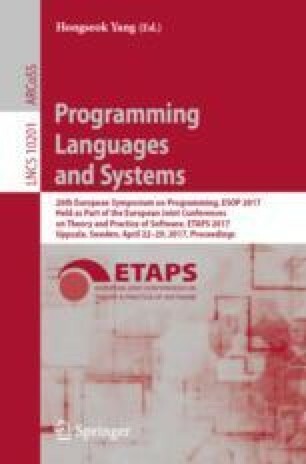 Robustness properties, such as satisfiability, reachability, and acyclicity, are important for a wide range of reasoning tasks in automated program analysis and verification based on separation logic. Previously, such properties have appeared in many places in the separation logic literature, but have not been studied in a systematic manner. In this paper, we develop an algorithmic framework based on heap automata that allows us to derive asymptotically optimal decision procedures for a wide range of robustness properties in a uniform way. We implemented a prototype of our framework and obtained promising results for all of the aforementioned robustness properties. Further, we demonstrate the applicability of heap automata beyond robustness properties. We apply our algorithmic framework to the model checking and the entailment problem for symbolic-heap separation logic. J. Katelaan—Supported by the Austrian Science Fund (FWF) under project W1255-N23. J. Katelaan and F. Zuleger—Supported by the Austrian National Research Network S11403-N23 (RiSE). C. Matheja—Supported by Deutsche Forschungsgemeinschaft (DFG) Grant NO. 401/2-1. We thank Tomer Kotek, Georg Weissenbacher and the anonymous reviewers for their helpful comments.